Synopsis: 2 years after the Inquisition won it’s great battle and saved the world, said world is causing its purpose into question. Now amidst the rise of a new threat to the world, the direction the Inquisition will take in the future must be decided. Meanwhile, the Inquisitor revisits old friends and learns about this new coming threat. Series: Additional content for the third (but standalone) installment in the Dragon Age video game series. Verdict: This was absolutely amazing. What, we have another add-on adventure for Dragon Age: Inquisition already? Not that I would ever complain, but I wasn’t expecting this so soon. 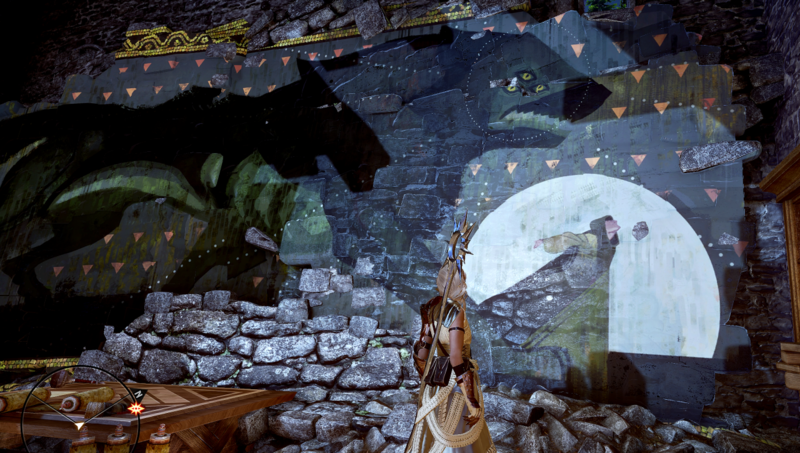 This is the epilogue to Dragon Age: Inquisition’s story, so again, anyone not familiar with the game is better off starting here, where I gush about the awesome characters, or here, where I talk about the game in general. It’s hard to talk about the last chapter in a 60+ hour game in a way that makes sense to people not already familiar with the story. Finally, we get a DLC focused on story and character–now that all three DLC are out, I do see how they compliment each other. One is an open world area, the other is a dungeon crawl, and the last is the narrative-focused emotional closing of the story. But it was really that last one that I was waiting for. Trespasser is everything that I wanted to see, and I actually could have done with the main game being structured more like this. I’m going to separate this into spoiler-free and spoiler sections. There’s three main things to this DLC. There’s character work, story- and lore-driven dungeons, and the ultimate fate of the Inquisition. There’s also a bunch of miscellaneous things–a few challenges at your (new) home base, schematics to find, puzzles to solve. Also, the music is great. Right away, we have the option of engaging in character moments with all of our companions (and why wouldn’t you?) Getting to talk to all of the characters again and have scenes with each of them, some of them touching, some humorous, some both–that was wonderful. I loved pretty much every character moment. Bonus is that some of the scenes change depending on what choices you made in the base game. The letters you can find that detail what your friends have been up to change as well, and are generally pretty entertaining. The entire atmosphere of meeting up with your friends in the beginning is great. The dungeons are linear instead of open world, more like the previous two games. They take us through a lot of information along the way, which our companions will comment on. We’re investigating what the Qunari are up to and getting clues as to what they want. And of course, we finally get to learn more about elven lore, and what the what is actually going on with it–also learning more about one of our most mysterious companions in the process. Because let’s be honest, one of the big things we’ve all been waiting for is the confrontation with Solas. (Because seriously, Solas, what.) And I do really appreciate the feel of following in his steps that we get. One huge distinguishing factor between this DLC and DA:O’s Witch Hunt (besides this one having a lot more going on than just finding the companion with the mysterious secret agenda) is that the path to the confrontation is littered with information about him that builds up to that moment. The game ties in the Qunari conflict with the history of the elves seamlessly–I wasn’t sure how we’d get that in one story before playing, but this really does come together into one cohesive plot quite well. I’m happy about that. And then there’s the fate of the Inquisition. Part of what this game does is set-up a new conflict for the future. And the Inquisitor decides how to face these new challenges. Meanwhile, the game presents several arguments for and against the options. The story really does wrap up a chapter of the Inquisitor’s history, and has its own series of slides showing what happens in the future to the world and characters depending on your choices. I really loved this DLC. It was very satisfying, and informative. And I have to say that I was not expecting it to set up quite what it set up. Just when I thought I knew what your motivations were this whole time, you tell me you were planning on destroying the world the whole time and the thing you were anguishing over all game long wasn’t that you’d caused the story problem so much as that you allowed our world to exist in the first place. Yeah, sure, he’s apparently sad that Corypheus caused so much unnecessary suffering in the course of trying to reach the Fade and rule the world. Because he only intended to cause the necessary suffering that comes with destroying the Veil and plunging the world into chaos. Considering the kind of death and destruction–for both people and spirits–that just having a bunch of tears in the Veil caused, I’m imagining some really bad stuff if it came down completely. Albeit, the end would probably come a lot quicker. Look, Solas, I really did like you. But you’re not thinking like a mature adult here. You woke up to a world radically different from yours, and you’re experiencing severe culture shock. It’s probably worse because your home is gone (and because you were the one who destroyed it in the first place). But most people don’t react to culture shock by trying to destroy the culture (except Corypheus, and he’s not a good role model). You can’t turn back time. And two wrongs definitely don’t make a right. It’s interesting that he mentions that he isn’t Corypheus, and he isn’t a monster. Dude. Doing the exact same thing, with the sole distinguishing feature being that you feel really bad about it, doesn’t absolve you of anything. …this is going to change how I look at every conversation I’ve ever had with Solas in the game, isn’t it? I’m going to need to start a new playthrough, aren’t I? So this really makes me want to know if there’s a fourth game, if Solas is the villain in it, and if the Inquisitor will be in it. And when I first saw the amputated arm for my Inquisitor, I wondered if it was a glitch–then when I realized it was deliberate, it was like ‘oh that makes total sense and is awesome.’ I’m a little sad that we never really got to play the character post-amputation. As for the experience of playing this DLC, I’m so happy. 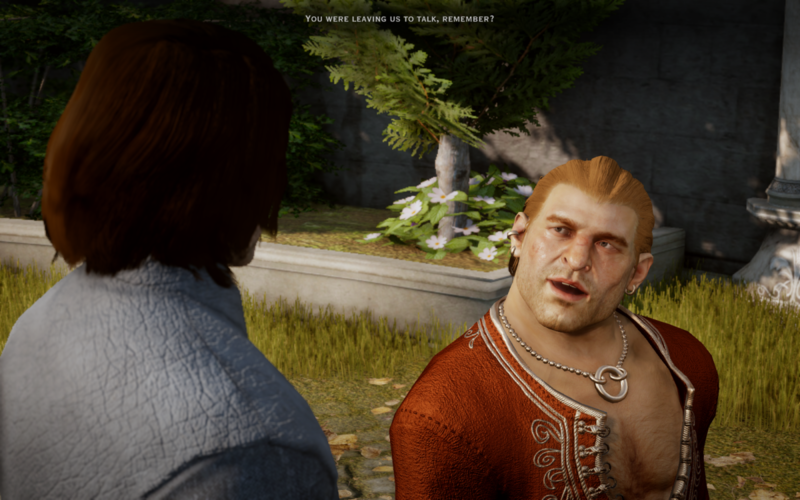 I loved Cullen teaching his dog to dodge fireballs and Varric driving his seneschal insane. Then accidentally giving away control of the harbor and being totally nonchalant about it. 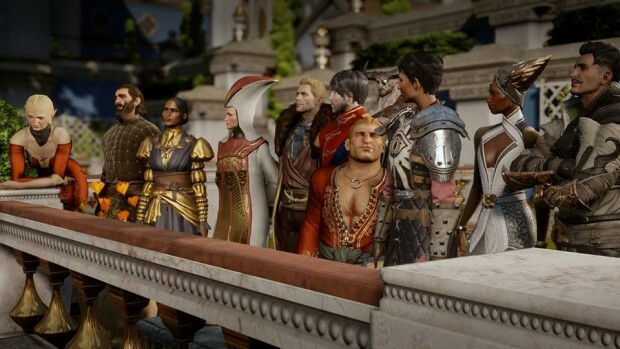 Sera even had some character development happen to her in the last two years, and it’s totally sweet to know she’s checking in on the Dalish Inquisitor and Varric to make sure they’re okay with the elven and dwarven revelations. I’m not going to detail every character moment, but suffice to say that I loved all of them. I also spent a bunch of time on the miscellaneous things, looking into every corner of the game. Finding things like a mystery shop in the middle of nowhere. And chasing that harlequin, I swear. The harlequin is my nemesis. And that was before I knew that what he was doing was planning to destroy the world. That was a little more extreme than I was expecting. So what, three years until the next game?